...because I downloaded Picassa 3 which has better collage options than Picassa 2. So obviously I went overboard and made a gaudy collage. Wouldn't you? For a more restrained and completely adorable collage, click here. This looks pretty neat, never gotten around to trying picasa before. very cute! I will download picasa 3. I use an older version; besides, my collage skills are rather primitive. This looks very professional. Anudivya, its does make my awful photography a bit presentable. As long as it's a food collage, I'm for it! Thanks for dropping in Sig, I've admired your blog for so long. Sagari, sent the email id. Thanks Purva, will send something for you event. Varsha, I have a bad cam too and even worse photography skills, but picassa makes life easier. 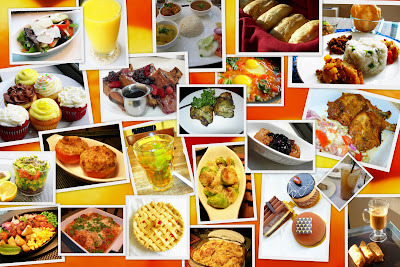 collage looks colorful with ur yum recipes!